These amazing facts tell us that much of who we are is programmed in our mind. We rarely think consciously about our actions and reactions. They are rote to a certain extent. The question is where does the programming come from that dictates our behavior? What if the programming loaded by our thoughts is wrong or at least out of date? Can we do anything about it? Absolutely. This is where Paul the Apostle’s valuable wisdom declares, “…Be not conformed to this world but be transformed by the renewing of your mind…” (Romans 12:2). The beauty is that we can change the programming of our brains whenever we want to. Our minds can be renewed. Here is a seven-step process toward mind renewal. We should now ask some questions about our “chill time.” What has been happening in our mind? What are our thoughts and feelings? Are we tense? Has our breathing been shallow? Has our attitude been poor? Psalm 4:4 says, “Stand in awe, and sin not: Commune with your own heart upon your bed, and be still.” As we commune with our own heart we will gather information about ourselves. Select one area or one thought, preferably something that needs to be changed or reprogrammed. This is a disciplined way of thinking that silences all the chaotic, competing thoughts. Consider one item and all of its ramifications. This kind of thinking is the beginning of redesigning our brains. Now we should write down our thoughts. Writing has profound effect on brain alteration. It also imprints a visual on our brain. Write down negative and positive thoughts. Feel free to be creative in writing. Draw pictures, link word groups, or create “origami” with words. Just let it flow. We should now read what we have written, paying special attention to the areas that we desire to change. This will alert our brains to areas of focus. This causes our thoughts to become more changeable. Exhibit some form of mental or physical action related to the destruction of the old thought and the establishment of a new one. For example, if we have been fearful we might imagine the fear disappearing as a puff of smoke, quoting, “God has not given us the spirit of fear…” (2 Timothy 1:7). Ask God to help with the process. He created the mind so He is capable of helping to reshape it. Use these seven steps for each thought, one at a time, 10 minutes a day, for at least three weeks. If we do, the experts tell us that we will have made great progress to reshape our brains for the better. Kyle Searcy has a passion for developing a new generation of leaders. He is a recognized and highly respected leader, bishop, prayer warrior, teacher, and author. 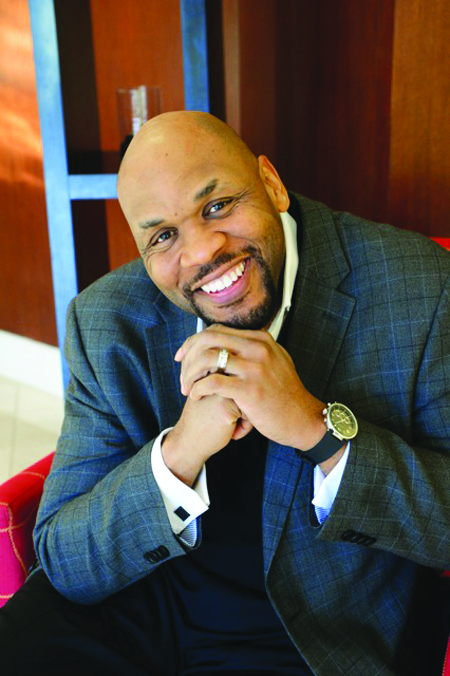 He serves as senior Pastor of Fresh Anointing House of Worship, Montgomery, Alabama. Kyle is married to Kemi and they have four childen and three grandchildren.